By David Veselka on Jun 23, 2014 - 4 Comments. This Fall, UK-based developer Playground Games is taking their love for cars, car culture, and open-world racing to next-gen with Forza Horizon 2 on Xbox One and Xbox 360. 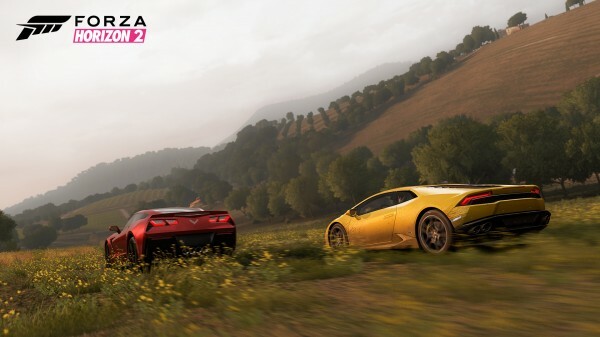 In Horizon 2, sequel to the original Horizon that launched on Xbox 360 back in 2012, the studio hopes to meld the best of two distinct elements and worlds: the attention to detail and realism portrayed in closed-track simulation racers, and the sense of discovery, excitement, and exploration present in massive open-world games. But most of all, Playground Games aims to deliver on three key pillars they outlined to us in a behind-closed-doors presentation at E3 2014: Beauty, Fun, and Freedom. Horizon 2 sure is a pretty looking game. 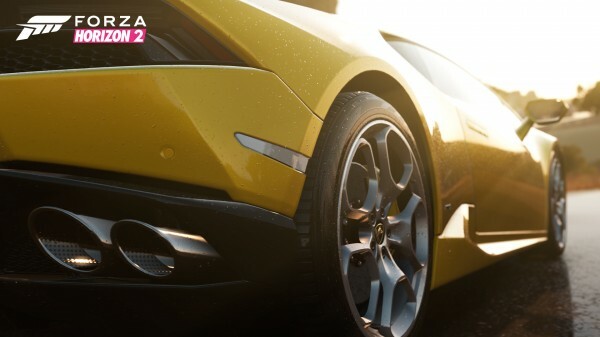 As was the case with Forza Motorsport 5 before it, rides like the all new Lamborghini Huracán have never looked so good, from the paint texture to the water droplets that shimmer off of it in the sun after a heavy rainfall. 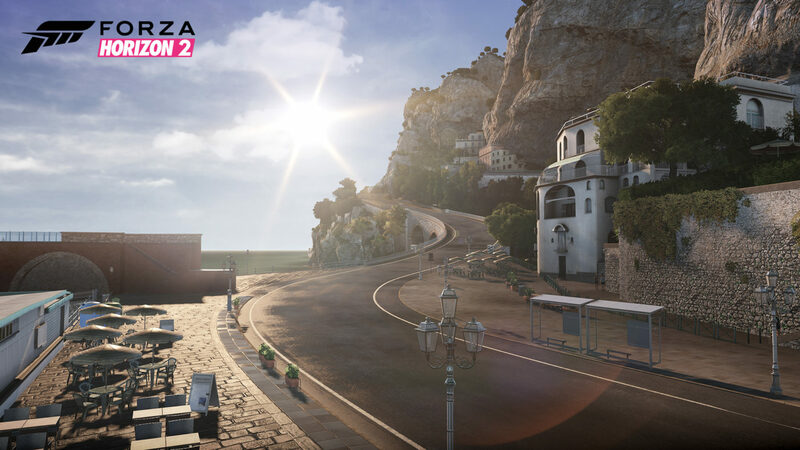 As Playground puts it, Horizon 2’s Southern Europe setting is “colorful, uplifting, and seductive.” It has it all: Nice, Tuscany, and 1080p. It’s in this exact sort of locale I can imagine James Bond and Vesper Lynd cruising the winding roads in an Aston Martin, top down, taking in the scenic vistas — that is, before a mandatory car chase scene ensues, of course. If I had things my way, I’d have pushed our driver demoing the game to keep on rolling off into the distance and into the game’s alluring backdrop, through fields, grass, and trees, as far as he could go. But, alas, the studio had other things to show us. 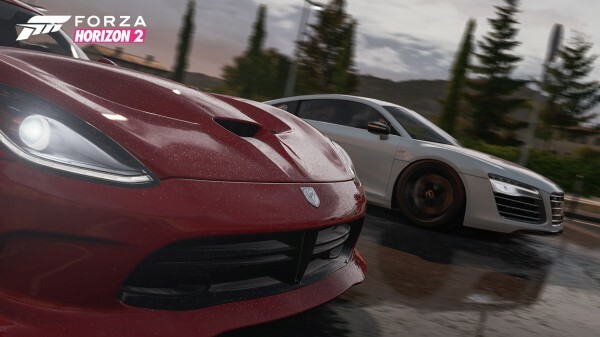 On Xbox One, Horizon 2 takes advantage of Forza Motorsport 5’s engine that was built from the ground up for Microsoft’s next-gen console, but also boasts a number of improvements that Playground tells us they just had to get in the game this time, including realistically generated atmospheric and weather effects. Having implemented a fully dynamic weather system along with a shifting time of day, the engine needed to be flexible, and so Playground developed a setup that accurately simulates Earth’s atmosphere, providing realistic lighting models that match all conditions. In Horizon 2, the sky is blue not because the designers chose the appropriate color, but because the atmosphere’s particle density when viewed at a distance dictates that’s the case. Even rainbows are “mathematically” generated. Forza 5’s Drivatar returns, but is now adapted to Horizon 2’s open-world nature. Not only does your Drivatar learn how you drive, it learns where you drive. In a connected world littered with other players’ Drivatars, you can use this to your advantage by tailing them during free roam and following them to secret locations, obscure shortcuts, or hidden car barns they might have found earlier. When you’re offline, your Drivatar earns you credits as it races and free roams all on its own and exactly in your syle. 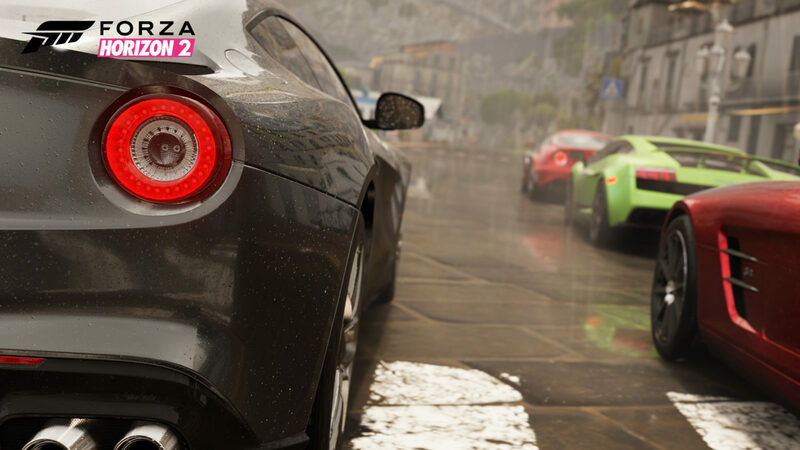 In Horizon 2, Skill Points are earned just as frequently by driving stylishly as winning races. The points can then be used to unlock Perks. A set of basic ones are assigned to every driver at the beginning of their career, but you can progress to unlock abilities like fast travelling, earning cash at a faster rate, earning more cash for creating custom paints, or earning more Experience Points while in free roam. I counted 25 perks during our session, but I may have missed missed a few. In addition to “Bucket Lists,” or groups of challenges for players to work through that will be continuously added to the game post-launch, it’s another layer that Playground games hopes will inject more excitement into Horizon 2’s progression system. Barriers in Horizon 2 only exist as they do in real life, which is a lot of ground to cover. As Playground explained, their new open world is three times the size of the original Horizon’s world and is filled with collectibles, challenges, and cars, of which there are over 200. And no matter what class of vehicle you feel most drawn to, there’s plenty of gameplay around it, including endurance events, cross-country races, and more unconventional races against other land and air craft like trains and planes. Playground told us there are over 700 unique racing events in addition to the return of Forza’s Showcase mode. Horizon 2 may not quite be an MMO racer, but its heavy online experience comes front and center using Xbox One’s dedicated servers and Smart Match matchmaking system. I wasn’t able to get a good feel for the game’s online multiplayer during our hands-off demo, but we’re told Horizon’s 2 online experience will be seamless and only one button press away. Using the world map to find where your friends are at, it sounds like you’ll be able to race on over and join in on their shenanigans or invite them to an event on a whim with absolutely no loading period. Car meets are back from the original Horizon where you’ll be able to share stats and car tuning specs while checking out others’. You’ll also now be able to create your very own Club of racers, up to 1000, who share similar interests. If you have that many online friends, you can fill it right up, or choose to stay more intimate with a smaller group of familiar friends. You have the freedom. You’ll be able to hit the open road with Forza Horizon 2 on Xbox One or on Xbox 360, developed by Sumo Digital, this September 30. We’re anxious to learn more about Horizon 2’s seamless online experience, so stay tuned to MP1st for more details as we get ’em.